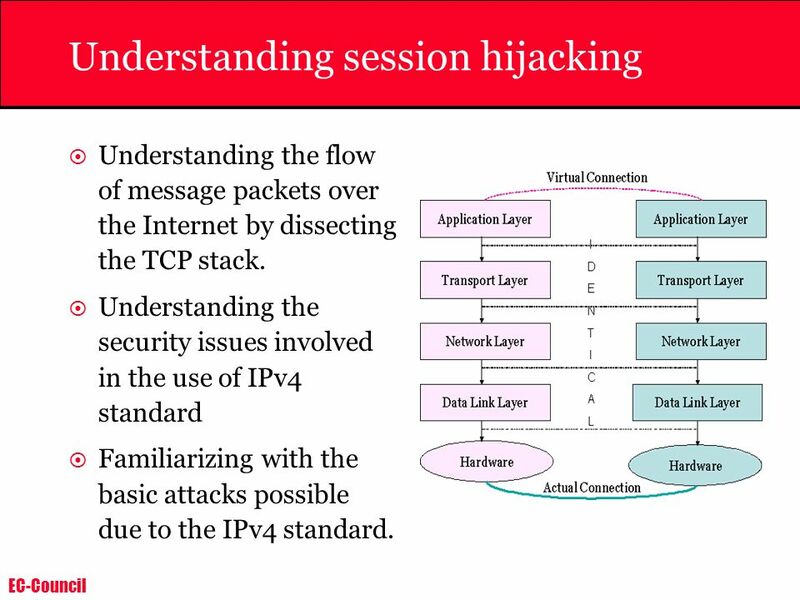 Understanding the flow of message packets over the Internet by dissecting the TCP stack. Understanding the security issues involved in the use of IPv4 standard Familiarizing with the basic attacks possible due to the IPv4 standard. 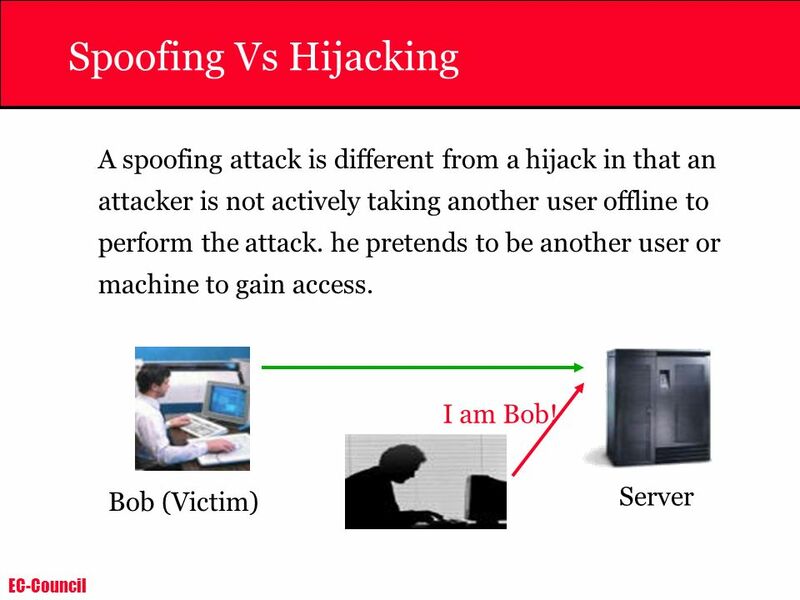 4 Spoofing Vs Hijacking A spoofing attack is different from a hijack in that an attacker is not actively taking another user offline to perform the attack. he pretends to be another user or machine to gain access. Bob (Victim) Server I am Bob! There are two types of hijacking attacks: Active In an active attack, an attacker finds an active session and takes over. Passive With a passive attack, an attacker hijacks a session, but sits back and watches and records all of the traffic that is being sent forth. 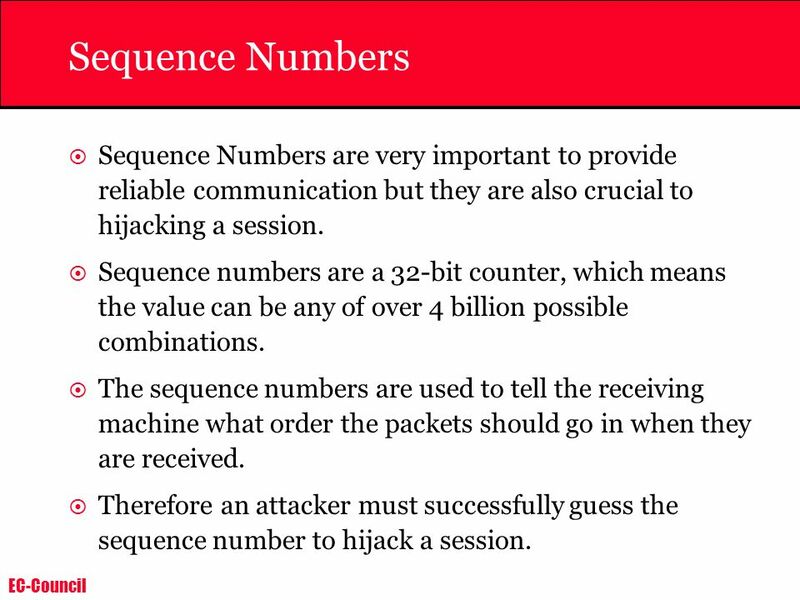 9 Sequence Numbers Sequence Numbers are very important to provide reliable communication but they are also crucial to hijacking a session. Sequence numbers are a 32-bit counter, which means the value can be any of over 4 billion possible combinations. The sequence numbers are used to tell the receiving machine what order the packets should go in when they are received. Therefore an attacker must successfully guess the sequence number to hijack a session. 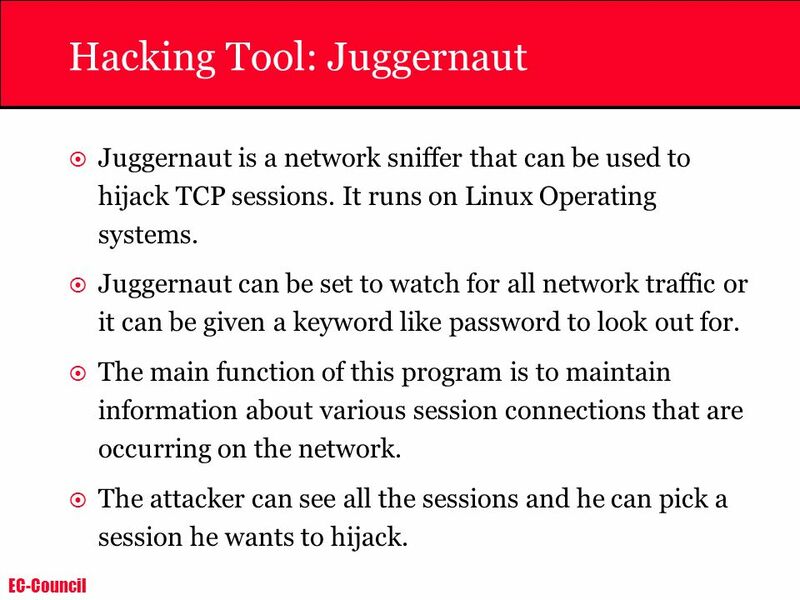 Juggernaut is a network sniffer that can be used to hijack TCP sessions. It runs on Linux Operating systems. Juggernaut can be set to watch for all network traffic or it can be given a keyword like password to look out for. The main function of this program is to maintain information about various session connections that are occurring on the network. The attacker can see all the sessions and he can pick a session he wants to hijack. 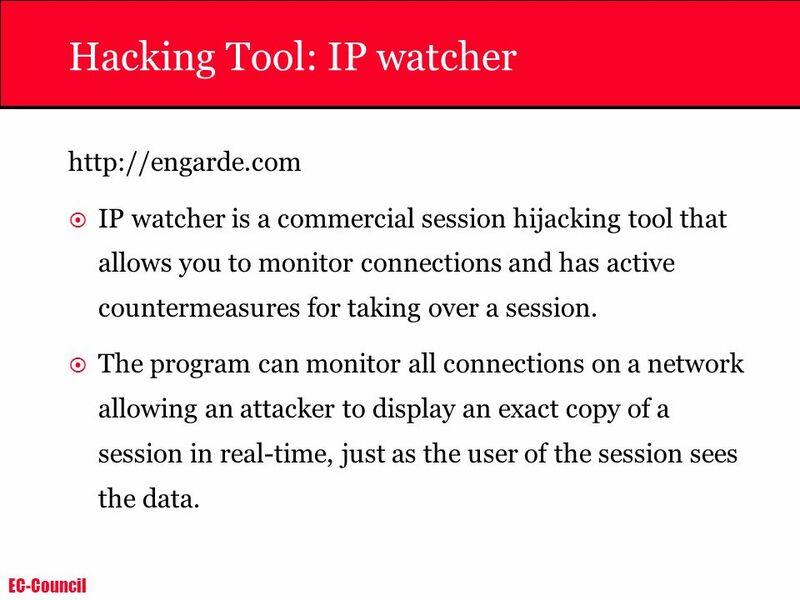 IP watcher is a commercial session hijacking tool that allows you to monitor connections and has active countermeasures for taking over a session. The program can monitor all connections on a network allowing an attacker to display an exact copy of a session in real-time, just as the user of the session sees the data. 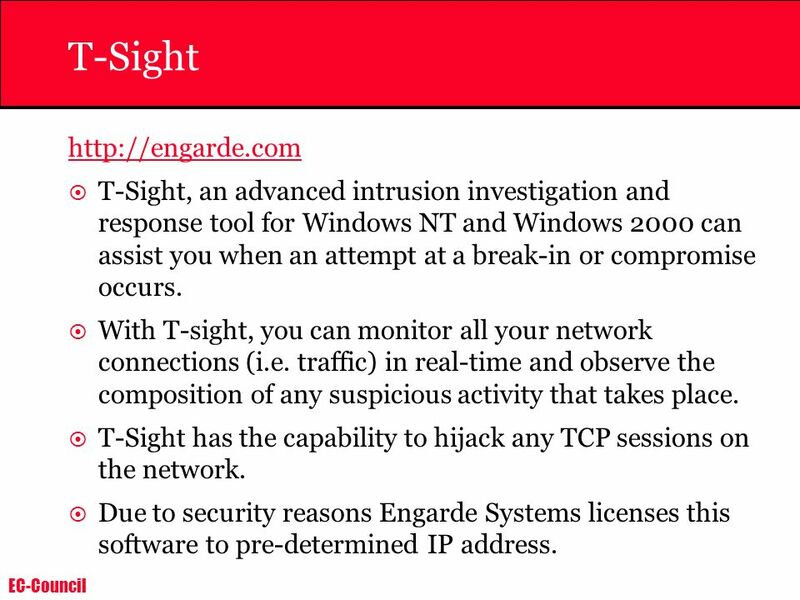 T-Sight, an advanced intrusion investigation and response tool for Windows NT and Windows 2000 can assist you when an attempt at a break-in or compromise occurs. With T-sight, you can monitor all your network connections (i.e. traffic) in real-time and observe the composition of any suspicious activity that takes place. 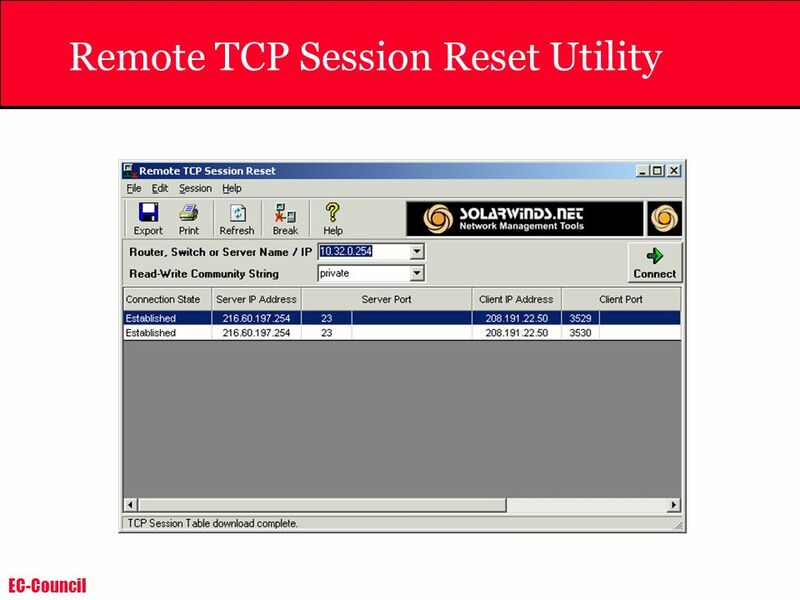 T-Sight has the capability to hijack any TCP sessions on the network. Due to security reasons Engarde Systems licenses this software to pre-determined IP address. 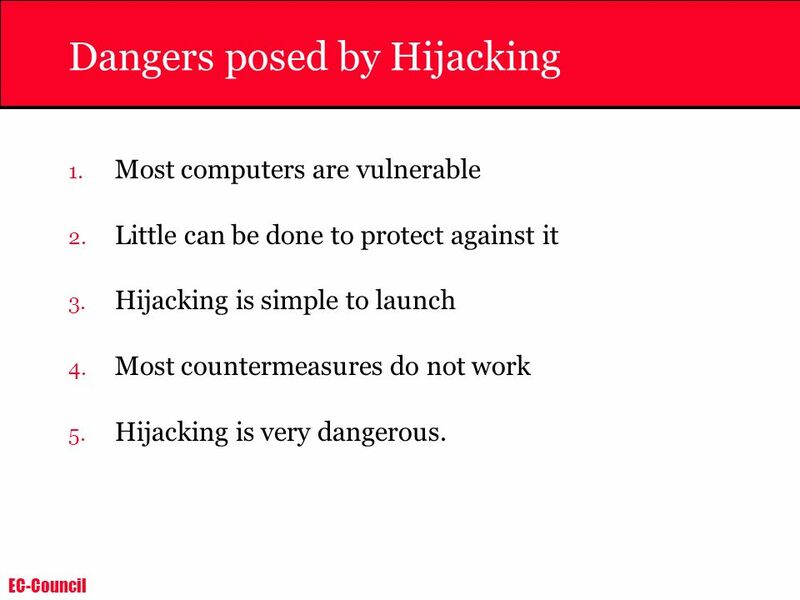 Most computers are vulnerable Little can be done to protect against it Hijacking is simple to launch Most countermeasures do not work Hijacking is very dangerous. Use Encryption Use a secure protocol Limit incoming connections Minimize remote access Have strong authentication. 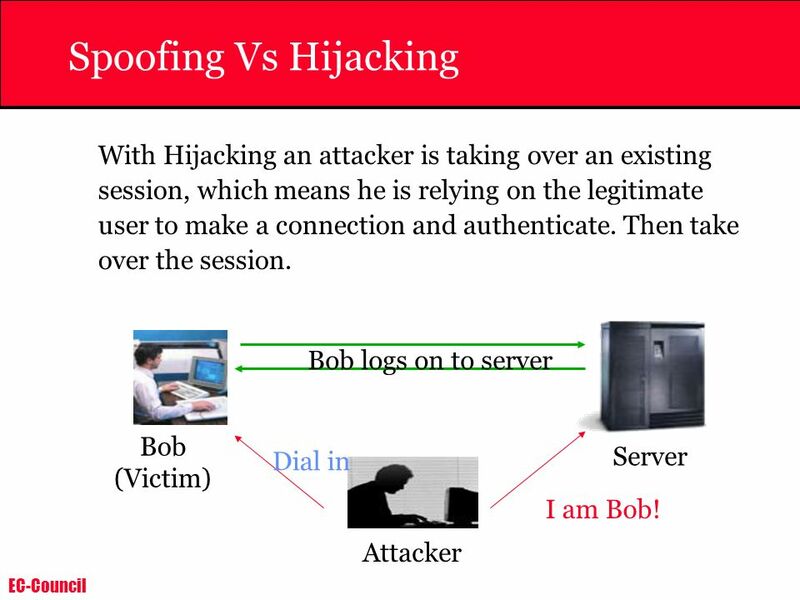 19 Summary In the case of a session hijacking an attacker relies on the legitimate user to connect and authenticate and then take over the session. In spoofing attack, the attacker pretends to be another user or machine to gain access. Successful session hijacking is extremely difficult and only possible when a number of factors are under the attacker's control. 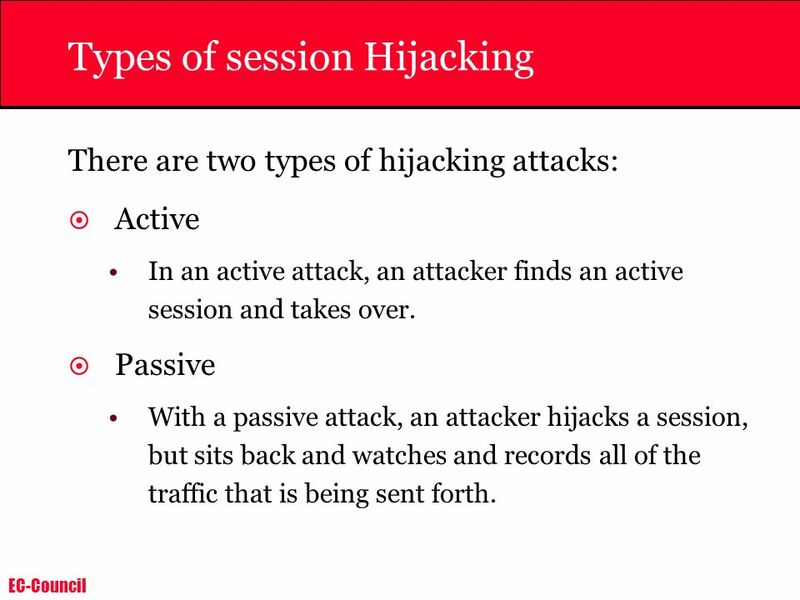 Session hijacking can be active or passive in nature depending on the degree of involvement of the attacker in the attack. 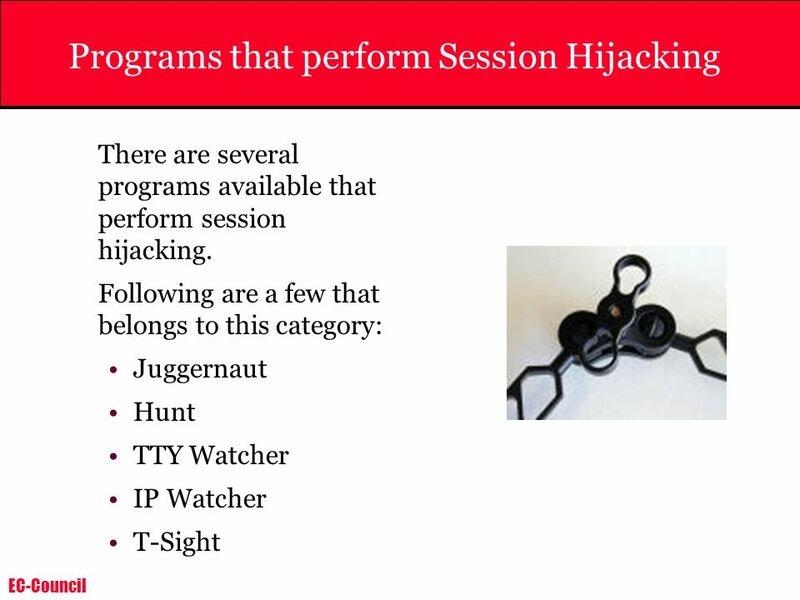 A variety of tools exist to aid the attacker in perpetrating a session hijack. 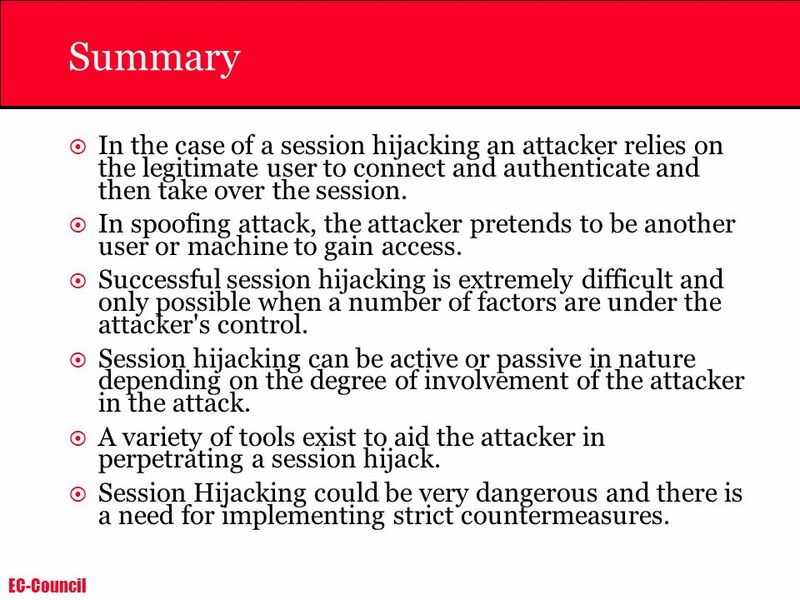 Session Hijacking could be very dangerous and there is a need for implementing strict countermeasures. 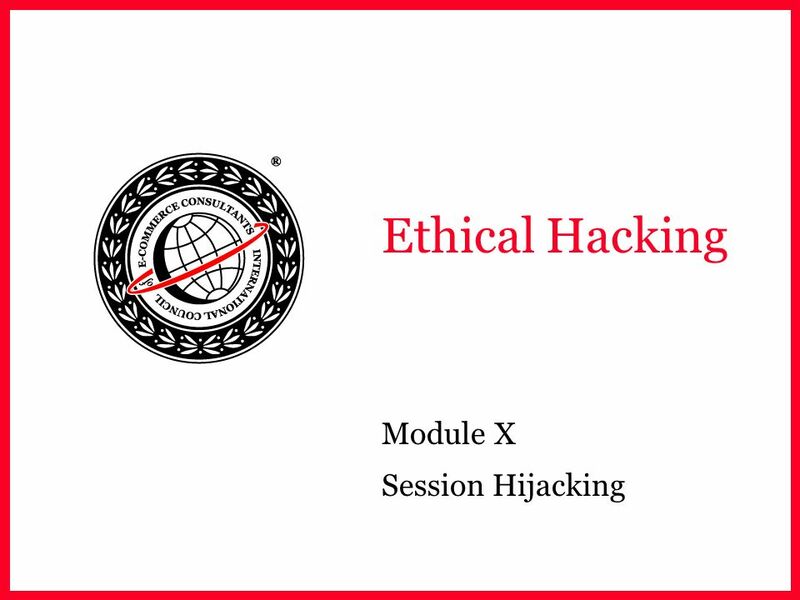 Download ppt "Module X Session Hijacking"
Ethical Hacking Module VII Sniffers. NETWORK SECURITY ADD ON NOTES MMD © Oct2012. IMPLEMENTATION Enable Passwords On Cisco Routers Via Enable Password And Enable Secret Access Control Lists. NS-H /11041 Attacks. NS-H /11042 The Definition Security is a state of well-being of information and infrastructures in which the possibility. Denial of Service & Session Hijacking.  Rendering a system unusable to those who deserve it  Consume bandwidth or disk space  Overwhelming amount of. 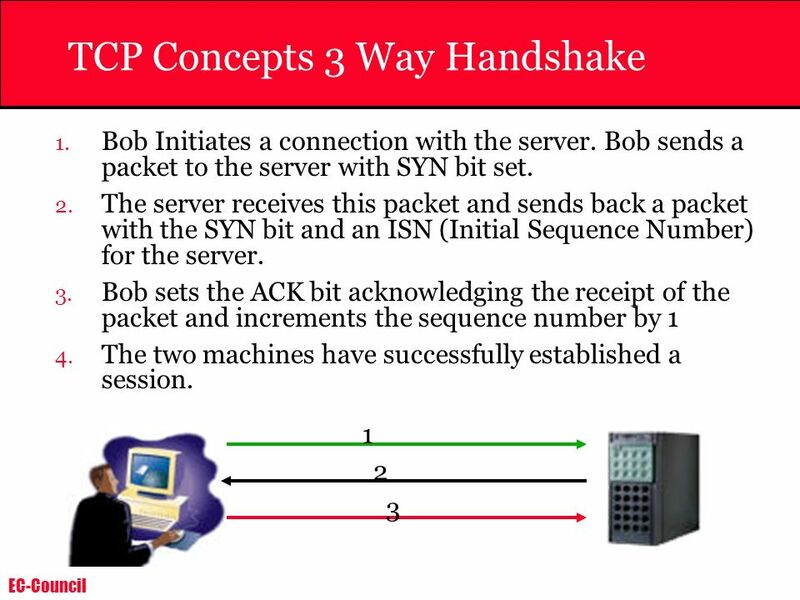 Sniffing, Spoofing, Hijacking This presentation is an amalgam of presentations by Mark Michael, Randy Marchany and Ed Skoudis. I have edited and added. Hacking WLAN // BRUTE FORCE CRACKER // TCP/IP. WLAN HACK Wired Equivalent Privacy (WEP) encryption was designed to protect against casual snooping, but. Suneeta Chawla Web Security Presentation Topic : IP Spoofing Date : 03/24/04. Hacker, Cracker?! Are they the same? No!!! Hacker programmers intensely interested in the arcane and recondite workings of any computer operating system. Security (Continued) V.T. Raja, Ph.D., Oregon State University. Hacking Presented By :KUMAR ANAND SINGH ,ETC/2008. Software Security Threats Threats have been an issue since computers began to be used widely by the general public. Distributed Denial of Service Attacks CMPT Distributed Denial of Service Attacks Darius Law.